Jet Moto Utility Rancher style 110Cc Atv from Motobuys.com features including Remote Control engine kill, foot brake, Automatic transmission with Reverse and electric start. 110cc ATV with over-size Tires & Reverse. This ranch style ATV, powered by a dependable 4- stroke 110cc motor. The durable double A-arm Front Suspension, Single Rear Suspension, drum/disc brake, and improved engine design will ensure a ride that is a cut above.. 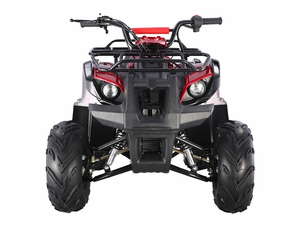 This ATV is lightweight and low maintenance and perfect for casual yard, field or trail riding. 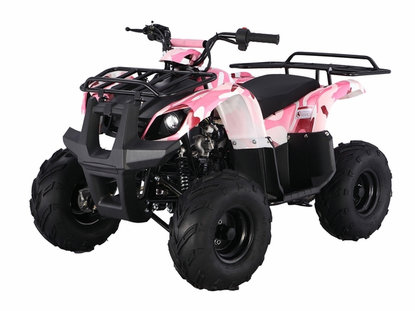 Emphasizing the safety for youths this quad mount offers helpful safety features including Remote Control engine kill, foot brake, Automatic transmission with Reverse and electric start. Fully Automatic (no hand clutch) with a CVT (constant variable transmission). Easy to Ride, just get on, push the throttle with your thumb and go. With the automatic transmission, it is easy for all your family and friends to learn to ride. Speed Limiter Adjustable from 7-30+ Mph - Throttle Screw which allows for Adjustment and Control of speed. The control is an easy to set screw adjustment in the right handle bar throttle control which limits how far the rider can push in the throttle. WATCH THE VIDEO ON THIS MODEL HERE! Brush Guard: Front bumper that protects ATV in the event of a frontal impact. Foot Guard : Protects rider from getting legs near the tires. Remote engine kill: Parent can turn off engine from up to 20 yards away. with the push of a button on a remote. Chain Guard: covering over the top of the chain. MOTOBUYS offers FREE shipping to your door for all of our Dirt Bikes, ATV's and Vehicles. With MOTOBUYS you pay NO SALES TAX!. Except for Arizona. Motobuys is proud to announce our new FULLY ASSEMBLED - READY TO RIDE OPTION! Let the pro's assemble your new ATV, it will arrive to your door built right, run tested and ready to ride. The only thing you do is 1. Hook up the battery, 2. Put gas in it and go riding! Or You Can Choose the Assemble Yourself Option (FREE). Some Assembly and Adjustments are Required: Use Lock Tight when assembling your ATV. ON ROAD: GAS SCOOTERS 1 YEAR PARTS AND ENGINE WARRANTY, 1 YEAR IN HOUSE LABOR ON PARTS AND ENGINE: MOTOBUYS.com through the manufacturer will supply new or rebuilt replacement parts in exchange for defective parts, as well as perform in house repairs on defective engines for a period of 1(one) year from the date of purchase at no charge. After 1(one) year, all repair cost are the responsibility of the owner. OFF ROAD: ATV'S, UTV'S, BUGGIES, GO CARTS AND DIRT BIKES offer 6 MONTHS PARTS, 1 YEAR ENGINE WARRANTY, MOTOBUYS.com will supply new or rebuilt replacement parts in exchange for defective parts for a period of 6(six) months, as well defective engines for a period of 1(one) year from the date of purchase at no charge. ADD A THH TX-10 Off-Road Helmet.Free Shipping with any Dirt Bike-ATV or Go-Kart Purchase!! Adult & Youth Sizes! 4 Color Choices!! Add Safety Flag -2 Piece Fiber Pole - Lowest Price - Meets All Off-Road Regulations! 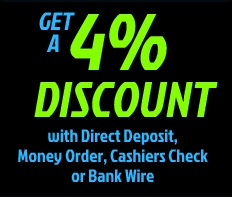 Free Shipping with Any Atv - Go-Kart Or Dirt Bike Purchase!